Osamu (“Osa”) Adler, 16, a junior at Loyola High School in Los Angeles, has earned the highest advancement award the Boy Scouts of America offers to Scouts, the Eagle Scout Award. A member of Troop 509, the Jet Propulsion Laboratory troop, Adler is “one of approximately 5 percent of all Boy Scouts who attain the Eagle rank,” according to Scoutmaster Dr. Martin Kast. Adler will be recognized in a Court of Honor ceremony on Friday, Oct. 17, at 7 p.m. at the Von Karmen Auditorium of the Jet Propulsion Laboratory in La Canada. In order to earn his award, he had to have planned and executed an Eagle Scout project. Adler’s Eagle project, which spanned approximately two months, benefited the families of Ronald McDonald House in Pasadena. It involved gathering donations of canned goods and cleaning supplies, preparing five home-cooked meals, and raising funds to purchase 19 fire extinguishers, two automated external defibrillators (AED), and three smoke alarms. 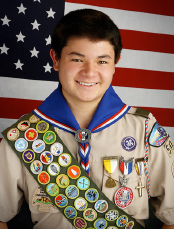 Adler began his scouting career as a Cub Scout by joining Pack 507 as a first-grader. In 2009, he earned his Arrow of Light and bridged over to Troop 509, where he served as assistant senior patrol leader, den chief, patrol leader and guide. Additionally, during his Scouting career, he earned various awards, including the Ad Altare Dei and Pope Pius XIII Religious Scouting Awards, the mile swim award, and the snorkeling and standup paddling awards. He was also invited to participate in the National Youth Leadership Training Program. In total, he has earned 40 merit badges to date, with his favorites being Aviation, Archery, Kayaking and Fishing. He plans to remain active in scouting and earn some Eagle Palms Awards. Throughout his years with scouting, Adler has had many memorable experiences, including camping at Cherry Valley, ocean kayaking in the Channel Islands, piloting a Cessna, and joining in on the challenges of two High Adventure outings. He attended Philmont Scout Ranch in New Mexico and Florida Seabase. Philmont involved hiking 100 miles in 12 days, as well as ascending up to 13,000 feet. Florida Seabase involved sailing and operating a sailboat for a week in Florida’s Key West. In addition to being active in Troop 509, Adler is a member of the Scouting Club, Club Japan, Junior Classical League, True Gentleman’s Club, and Curious Catholic Club at his high school. He also co founded and leads the Fishing Club. At Loyola, as in scouting, he has held and will hold leadership positions. Adler has been selected to help run the Freshmen Retreat as Junior Ground Crew, and assisted in running a Latin competition, Southern California Regional Amici Madness (SCRAM). Outside of school, Adler volunteers as a teen lead at the St. Bede parish in La Canada, plays piano, and enjoys playing basketball with a local league and soccer with AYSO. He was a member of a Pasadena Bruins basketball team for approximately seven years before he began playing with various local basketball leagues. In the spring of 2015, Adler plans to travel to Japan with Loyola High’s Club Japan and visit sites and relatives. He is the son of Suko Gotoh and Bill Adler, and the younger brother of Eagle Scout Billy Adler.